Angela Kulig: THE GODS OF MARKET STREET. See the NEW cover. Read it for nothing. Vote to keep it going. THE GODS OF MARKET STREET. See the NEW cover. Read it for nothing. Vote to keep it going. 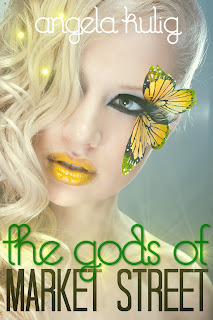 The second chapter of THE GODS OF MARKET STREET is now LIVE. Along with this, the brand new cover. As much as I appreciated all the love the previous cover (with the same image) got it, was making me INSANE. I had to toss it together quickly to do the submission (think <5 min) so I went back and changed it up a bit. PLEASE. Wander over to JukePop Serials and vote for it. You can vote for every chapter. As much as I love and want you guys to get to read this serial for nothing, this gig only pays if I do well. Provided no one dies, starting next week I hope to update it Tuesday & Thursday until it's completion. Apparently, my editors have the nerve to be human. In addition to the serial we are editing 3 full length novels--two of which are mine! I still owe you guys your 3 chapters of PIGMENTS OF MY IMAGINATION in honor of my hitting five thousand Twitter followers BUTTTTT I decided to roll it into this awesome thing starting tomorrow called Pages of Pigments. There is going to be SO MUCH AWESOMENESS involved.